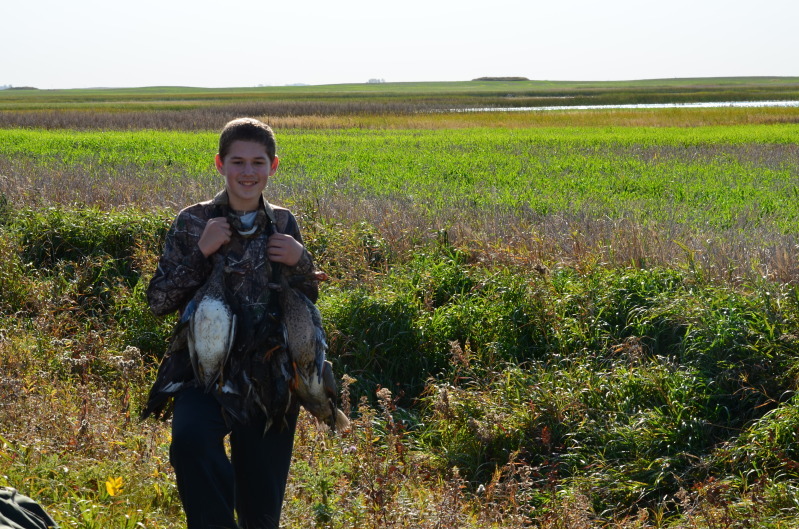 The following journal excerpts come from Nate Faulkner, 12, who enjoyed his first trip to North Dakota to hunt the non-resident duck season earlier this month. The trip included his father, Richard, as well as Richard’s friends DeWayne Taylor and Kurt Culbert. Day 1. We arrive in Fargo, North Dakota at about 11:00 pm central standard time. I’m waiting for my luggage with my Dad and his friend Kurt. The airline opens the oversized luggage window, drop out Kurt’s gun case but not ours. Non of our luggage made it on the plane from Chicago, IL to Fargo ND. We drive to the Hilton Garden Inn in Fargo ND to stay for the night. We had planned to pick up our luggage along with the final member of our hunting party. We slept on great beds, it would be the last time for the entire trip. Day 2. 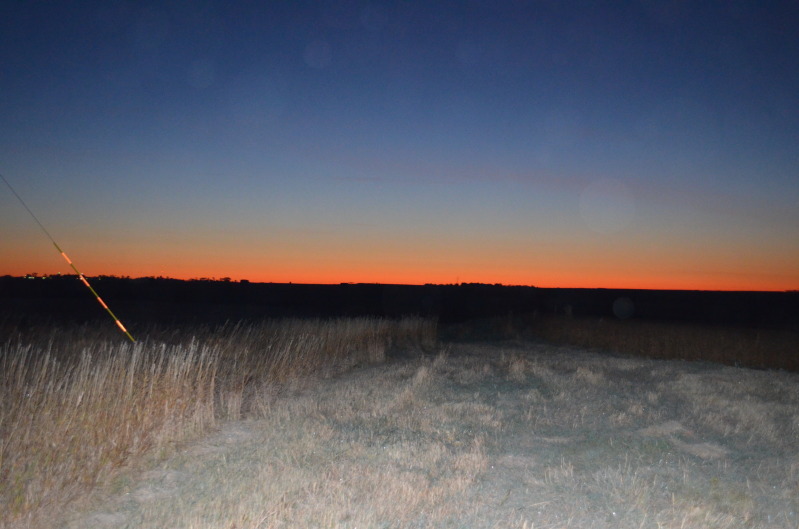 We wake up early to go and scout for the hunting to come. We ride for a few minutes and pull into a field. 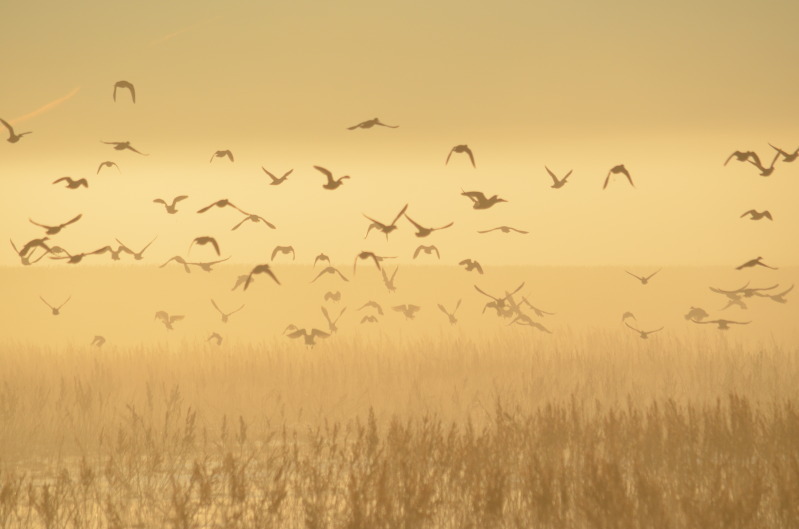 All of a sudden the field erupts in a blanket of waterfowl. Ducks are flying everywhere, it is the most ducks I have ever seen. We decided to name it “Nate’s Place”. Everything appeared to be good, that feeling melted when we saw there were crops still in the field. 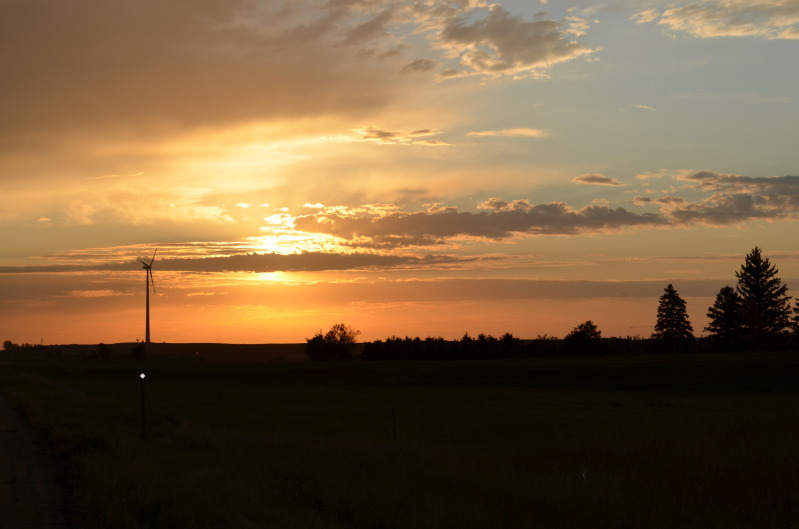 The law in North Dakota states that you can not hunt property that has a posted sign or has crops in the field, without the permission of the land owner. So we drive away and plan to come back later to try and find a house near the field. We ride around and find a few good backup fields in case the owner of what we have called “Nates Place” says no. Next we go back to Fargo to pick up our luggage and the last member of our hunting party, DeWayne. 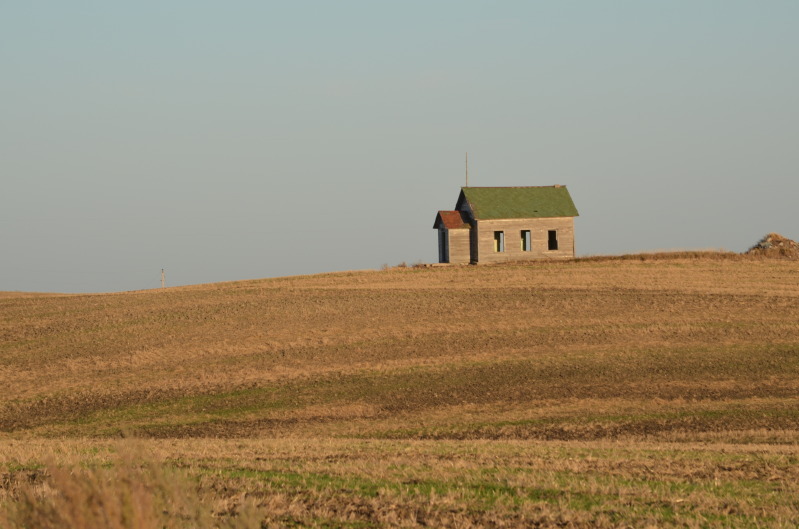 We ride back to “Nates Place” and find a house next to the field. We go up and knock on the door, no answer, we knock again…..no answer. The positive thinking we had is starting to fade. Since no one was home we ride to another house close by. This time someone comes to the door, a lady comes to the door. It turns out she and her husband Dave own the field. She provides us with her husband Dave’s phone number. We wait to call him as he is working at harvesting beans. We ride on to New Rockford ND and pull into the Bison Lodge where we will stay the rest of the trip. We call Dave and he says have permission to hunt the field as long as we do not mess up any of the crops. Day 3. 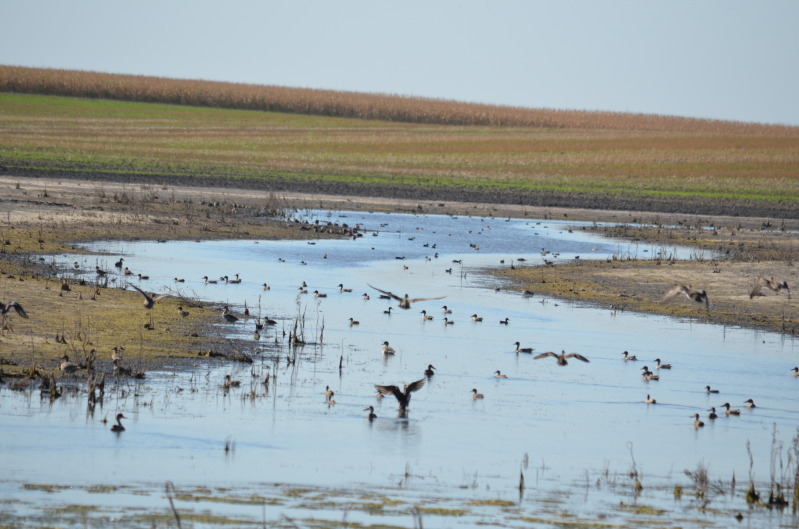 This is the opening day of non-resident season in North Dakota. 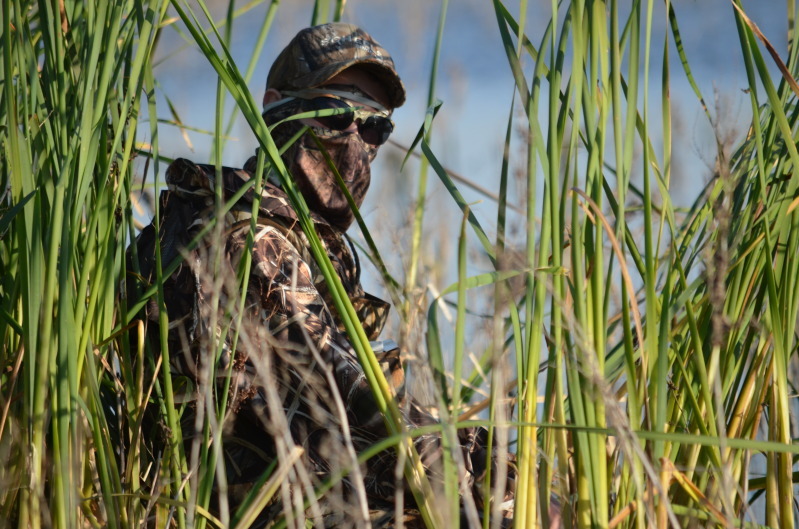 We head out early to “Nates Place.” We get out there and the ducks are here and there but not a whole lot of ducks. We are beginning to get concerned, but my dad says it should be a good hunt as when we came by yesterday it was later in the day. 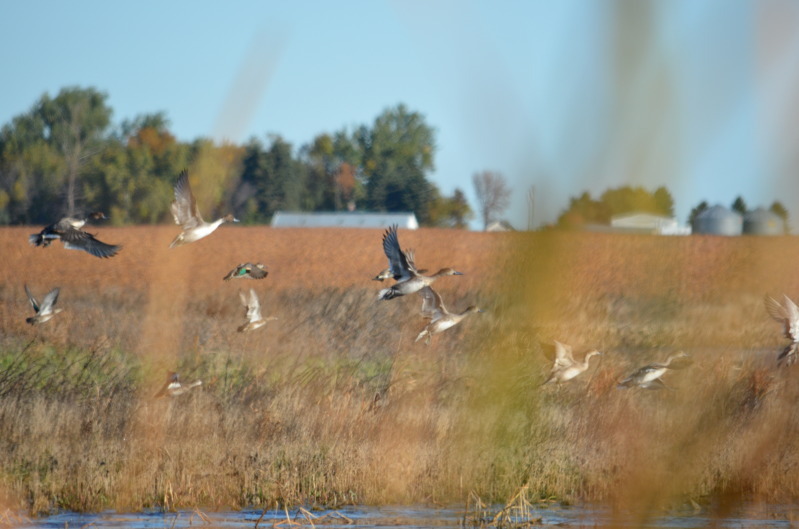 We get set up in the grass, decoys set, guns loaded. It was a little past legal and the ducks start flying like there is no tomorrow. My dad limits out in about 20 minutes. I have about 2 ducks and it started to slow down. the rest of the hunt was pretty good. I had fives ducks and the limit is 6. Mr. Dewayne and I moved down the bank as the birds started to fly a different path later in the morning. The birds would fly to us then move off. Finally we saw a pintail as it was making a line for us. I raised up and pulled the trigger. It was the first time I had ever limited out. I also shot my first gadwall, and blue wing teal that day. We spend the rest of the day scouting for the trip. We settle on a place my dad has hunted before and called the Juanita Spoonie Hole. Day 4. We wake up and start driving to the Juanita Spoonie Hole. We get there and not much happens – most everyone has one bird. My dad and I move to a different hole that is not far away on the same block of land. Birds are constantly flying over us just too high. 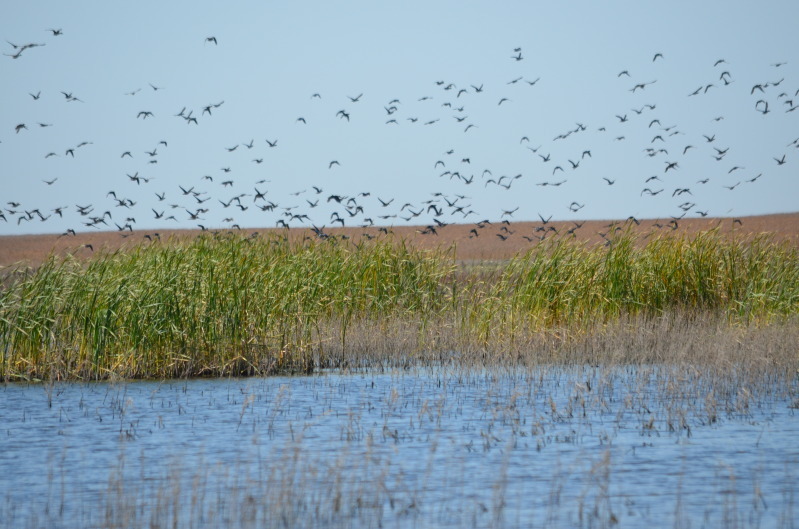 We try to move to where the birds are flying but the water is too deep and we have to keep looking for a spot until we find one where the water isn’t as deep. We move into the water and I shoot 3 more birds. I ended up with 4 ducks this day. We plan on trying to find a spot for an afternoon hunt but nothing ever comes up. Day 5. This is the last day we get to hunt on this trip. We go back to “Nates Place” just in a different spot. We did not see many birds at all that day much less shoot many. One hen pintail came flying in and I raised up and shot it. The bird comes down 4 feet behind me. Other than that bird I didn’t shoot another bird. So we go back to the Bison lodge and pack up for our flying home in the morning. It was a great trip and some really neat land to see. I really enjoyed seeing another part of the country. 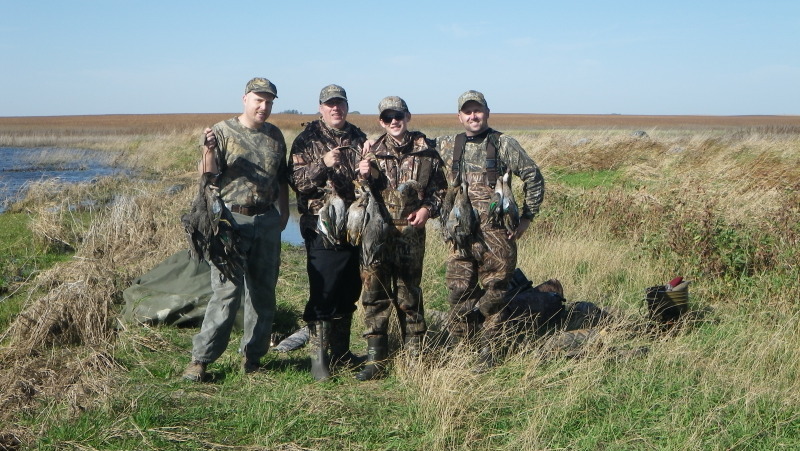 This entry was posted on Wednesday, October 19th, 2011 at 2:25 pm	and tagged with duck hunting North Dakota, ducks, Nate Faulkner, ND hunting, Richard Faulkner, youth hunting and posted in 2011, Day Afield. You can follow any responses to this entry through the RSS 2.0 feed. « Groceries almost a goner … Need restocking. Nate, great story! I am glad you did so well and had a good time.